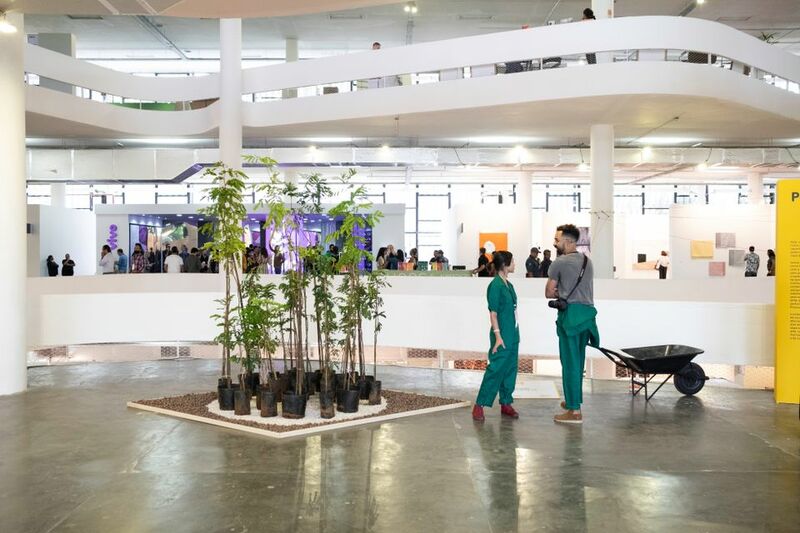 Most dealers had a sunny disposition at the public opening of the 15th edition of SP-Arte in São Paulo today, despite some of the recent events that have clouded the cultural skies of Brazil. These include a devastating fire at the country’s national museum last September allegedly due to “years of negligence” by the Ministry of Culture. Yet the dissolution of that same ministry in January by the nation’s polemic new conservative president, Jair Bolsonaro, raised alarm about the financial future of public art initiatives across the country. If the mood of SP-Arte is any indication, these social and political events seem to have had little effect on the art market. Many Brazilian dealers say they have seen an uptick in business since the start of 2019, and more than one São Paulo-based museum acquired new works by the end of the fair’s VIP day, even if sales during the opening were slow—which many say is typical at this event. If there is one museum holding some sway over sales, it is the state-run Pinacoteca. At Galeria Periscópio, a mixed media quilted work by the emerging Brazilian artist Randolpho Lamonier sold to the institution’s director, who will donate the work to the collection, for around BRL30,000 ($7,750). Part of the artist’s Prophecies series, the 2019 work portends in sewn lettering that “In 2040 we are going to legalise love and other less intense drugs”. A private buyer also picked up a large wooden “bean” sculpture by the established Brazilian sculptor Jose Bento from Millan Gallery for an undisclosed amount, donating it to the Pinacateca. And Fortes d’Aloia & Gabriel sold a painting by the Rio de Janeiro-born artist Ernesto Neto for BRL230,000 ($60,000), who currently has a recently opened survey at—you guessed it—the Pinacoteca. “Brazil is not a country that is used as an example of stability, so [political swings] don’t deter our business as much,” says Alexandre Roesler of Galeria Nara Roesler, which sold the Brazilian artist Laura Vinci’s Loose Leaves (2019), a delicate large-scale installation of gilded leaves suspended by wire, to Sao Paulo’s Museum of Modern Art (MAM) early on Wednesday afternoon for what was the “top end” of the institution’s acquisition budget for the piece, according to Roesler. The gallery, which has spaces in São Paulo, Rio de Janeiro and New York, has participated in SP-Arte since its inception. The event, Roesler says, “has offered a lot of professionalisation to the market here”, and has helped bring more international attention to both established and emerging Brazilian artists. It is in the international arena, however, that SP-Arte has lost some ground lately, perhaps due to its domestic distresses. The fair is down by around a dozen art galleries this year, with 120 compared to 131 in 2018. The overall number of exhibitors, however, has remained steady at 164 due to more participants in the fair’s design section. And although major global blue chip galleries like David Zwirner and Lisson have participated for several years, others like White Cube dropped out after 2017 and Marian Goodman after 2018; overall the presence of international galleries has slipped by around 20% in the last five years. This might have to do with the downturn in the economy over the past several years, one that finally seems to be righting itself—perhaps due to Bolsonaro’s recent bullish economic reforms, although the 2018 edition of the fair boasted a 24% boost in sales after three years of falling profits. “The past four years, there was severe economic depression in the country, and the fair is not immune to these things, but we were still helping to maintain a healthy art market here,” says SP-Arte’s founder and director Fernanda Feitosa. “Now, though, there is some momentum,” she says regarding the bump in sales last year. Indeed, a few Latin American galleries noted that the economic recovery and relative fiscal stability that has ensued since the uproarious 2018 election ended were selling points for participating this year. The key sales that have been made during the 2019 edition so far, however, are mostly work by Brazilian artists being offered by Brazilian galleries and bought by Brazilian institutions, suggesting that international interest and participation is still low. “I love coming here, the collectors are informed and engaged. It is still very much a regional fair with a lot regional interests, though. It’s not one of those events you sell a wide range of work quickly,” says the New York-based dealer Alexander Grey, who is showing works that he hopes appeal to this buyer base: sculptures by Melvin Edwards created during the artist's’ stay at the São Paulo-based Aurora residency and works by the Uruguayan-born Conceptual artist Luis Camnitzer, all ranging in price from $50,000 to $300,000. Grey noted there was interest from many buyers, but he had yet to confirm a sale during the VIP opening. Whether that has to do with the "non-Brazilian-ness" of the artists in his booth or the relatively high prices remains up for debate. To be sure, there is a lot more incentive for locals to buy. For the run of the fair, per a deal with the local government, residents of the state of São Paulo are not subject to the hefty 45% tax rate, instead paying just 17% on any art purchases. That means, though, that a buyer from elsewhere, whether Rio de Janeiro, Buenos Aires or New York City, will still have to pay the former rate. In addition to the tax exemption, the fair as a whole, also benefits from the nationwide Rouanet Law, a 1991 statute that allows organisations and individuals to use up to 1% of their income tax to fund cultural activities. This year, SP-Arte is authorised to raise around BRL2.6m ($675,000)—and has made half of that so far—to help offset its operational costs.